This week's Skywatch Friday features a 70-by-70-foot mural on an air-intake building of the Central Artery tunnel. You can find this mural between Summer and Congress streets, and is the work of Otavio and Gustavo Pandolfo. The Brazilian twin brothers are known as Os Gemeos. 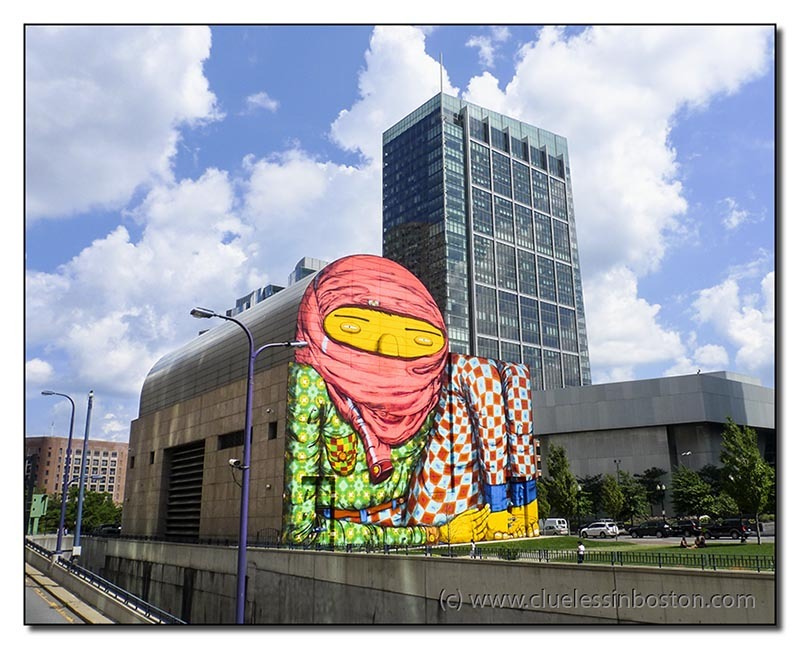 The mural is co-sponsored by the Rose Kennedy Greenway and the Institute of Contemporary Art. The mural will be on display through Nov. 25, 2012. Visit other Skywatch Friday sites by clicking here. That is a bit different and as mama Zen said, very cool indeed. It certainly GRABS the eye. It's a fun look in the big city. It would make me smile. Mega impressive, I wonder how long it took them to do this. You have to wonder how difficult it is to create an image of this size. It is the first time I hear of Os Gemeos. Interesting mural. very impressive mural! i like it ! Pretty eye catching!! Boom & Gary of the Vermilon River, Canada. Captured beautifully! Visiting from Sky Watch Friday. My Skywatch, hope you'd come and see. wow this piece of art is amazing !! !